KUALA LUMPUR, 6 Apr 2014 – More than 2000 participants made up of autistic children, their parents and members of the public participated in a 5 and 10 km ‘Fun Run’ here today. The run held in Tasik Titiwangsa here is to collect funds to provide the best care possible to children with autism. 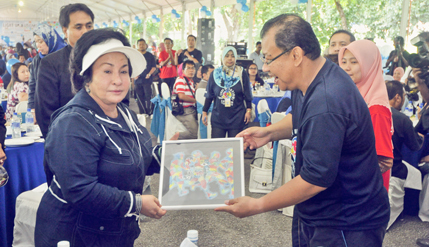 It includes an aerobic exercise where the wife of the Prime Minister Datin Seri Rosmah Mansor also participated. Apart from raising funds the run is to increase awareness of autism among the public. It was organised by The National University of Malaysia (UKM), Permata Kurnia and the Ministry of Women, Community and Family Development. Datin Seri Rosmah in her speech said an International Seminar on Autism on the theme ‘Autism Is not A Tragedy, Ignorance Is’ will be held on the 22nd and 23rd of this month at the Putrajaya International Convention Centre. The seminar is aimed at tackling the problem of autism which can be a burden to those afflicted by it and especially their families. Autism can have a tremendous impact on the families as a child with autism looks no different from any other child and are thus expected to behave as normal children do. This sometimes caused strain in the family, because they don’t see it as a medical condition but as a behavioral problem. Sadly because of this ignorance, marriages sometimes fall apart because parents often blame each other for failing to control the child. The upcoming seminar will see participants from at least 34 countries. She said the first ladies from Albania, Sudan, Morocco, Republic of Kyrgyzstan and Sri Lanka have confirmed their attendance. Present at the half day event today was the Vice Chancellor of UKM Prof Dato’ Dr Noor Azlan Ghazali, students and members of the public.